It is a notice to the general public, and it may or may not be addressed to anyone in particular. There are various kinds of public notices related to properties having to do with different matters. The reason why it should be put in a Newspaper is: A public notice is to reach large number of people to serve it purpose. Newspaper as a medium of communication, reaches out to the largest number of people. A public notice is an advertisement placed in a newspaper by an individual, government, businesses etc. It may be relate to contracts, closing a contract or even unclaimed property and so on. A notice is published to the public in general in order to hear any opinion before an order of the law is passed. This is a kind of procedure followed in every civilized country. It is a tedious task while making a property deal of any kind as it brings about rules and regulations laid down by the government, which is legislation. Hence it involves court procedures. The cost factor and the ownership of a property is often a major cause of dispute in property related matters. In such a scenario, a public notice in a newspaper makes the procedure a transparent one. A public notice regarding the legal heirs of a property happens when a property is transferred on a third person's name who does not in any way belong to the family. How the transfer happened is a matter of investigation. However, for a case or a proceeding to begin, placing a public notice ad in a newspaper, in relation to the said property is the first step. This procedure is carried out and is in accordance with the law. A public notice in this regard absolves all responsibility of the seller and the purchaser once the sale is done. This is the reason a time period in given (prior to the deal) to anyone who could have any objection in the said property being auctioned. 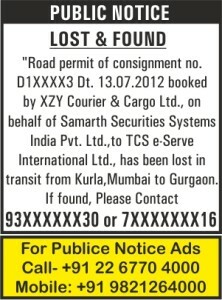 A public notice ad of this kind is placed in a newspaper to know if there is anyone else holding the ownership of the said property, in any way. This is done to stay away from any legal hassles once after the sale/purchase of the property is carried out. This is a formal way to avoid legal hassles. public notice for cancelling and terminating a property agreement etc. This public notice ad is placed mostly by govt. authorities before auctioning a property that has been taken over by the govt. This ad serves the purpose of sending the auction message to the general public. a public notice ad is placed to avoid any on toward inconvenience. I.e. what if after a deal is made, someone claims to be the owner or have a share in the property? 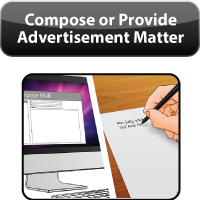 Therefore, for this ad serves as a disclaimer solving many problems in the later stage. a public notice ad is issued as a safeguard stating the ownership, which as per law is automatically(by default) goes to the heir. a public notice ad is placed in the newspaper so that in case if anyone tries to sell the property, it stands to be illegal. a public notice ad is placed a formality involved, informing all the parties concerned with the same. This is the basic intent of this ad. There are times when in spite of all being well in a property deal, there however is an oral disagreement between the two parties. But after a while, the two parties come to a mutual agreement and wish to proceed ahead. This ad is placed in order to maintain a written proof regarding the Oral agreement, in a leading newspaper. E-mail your property public notice ad content to us on publicnoticeadvt@gmail.com or call us on 9821254000 / 022-67707001/ 022-67707002 /022-67707003. We will be glad to assist you. This is Public notice ad placed by an organization(bank) to mortgage a property. Hence this is a public notice ad related to property. 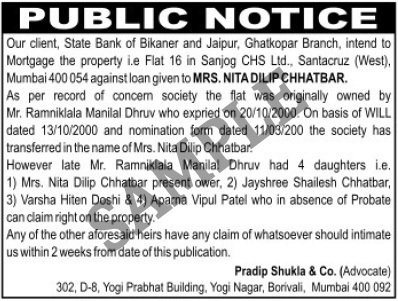 This ad is a disclaimer, which is put up in a newspaper to invite any objection(if any) , before the property is taken over by the bank and resold. 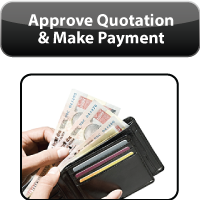 It is a standard procedure and is part of a legal requirement. This public notice is put up by the lawyer representing the Bank.